Hey, hey, hey! In an earlier post I promised a advanced tutorial using Motions Craft's new animated stamp and die sets that have been released today. This is that tutorial. I'm going to be using the small animation envelope die cut set and a dragonfly from the butterflies animated stamp set. Before we get started, I will say that I was impressed with the packaging for the die cut set. The dies came on a thick sheet of magnetic sheeting that feels like it would be hard to bend. We're going to make a hands free animation card. Well, as hands free as a card can get. All the recipiant has to do is open it. Decorative paper - 8" by 4"
Links to all the supplies I used are in my Stash and at the bottom of the page. 1. Form the Animation Envelope Motion Crafts made this part really easy for us. Get your favorite decorative paper and diecutting machine. I personally use the Spellbinders Platinum 6. You can use any size paper that fits in your machine but it has to at least be 8" by 4" to make the envelope. Place the large die on the paper and run it through your machine. 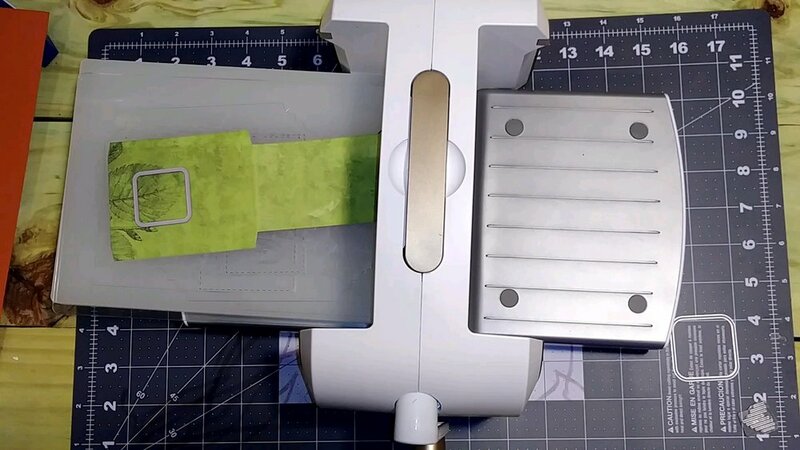 Once you have the basic shape, use the small square die to cut a window for your envelope. 2. Cut your Grid Using the same large die, cut your animation grid down to size. Use the side of the die WITHOUT the flaps and make sure the lines on your grid are horizontal. Run this through your die cutting machine. It's possible your grid won't cut all the way through so just fold at the cut in the grid until it snaps off. This is still slightly too big to go in your envelope so use a bypass cutter to trim about an 1/8" off one of the long sides of the grid. Hold the acetate tightly and close the handle SLOWLY. This will produce a straight cut almost every time. 3. Make Pull String Opening Get a small piece of card stock and fold it in half. Using one of the tab dies (the square one in this case) cut the shape of your tab. Make sure you don't cut the fold. Run this through your machine with the cutting part of the die not contacting with the paper. This will make it so your tab opens at the fold. Put the animation grid inside the tab and use washi or glue to secure the tab to the grid. With the tab secured use a hole punch to punch a hole. Tie a ribbon through the hole and leave a long tail. This will be used later to pull your animation grid. 4. Stamp Your Image This part can be tricky but if you take your time you can get this right. Our animation grid is going to have the black lines going horizonatally. That means that the lines on the dragonfly need to be horizontal as well. The dragonfly itself is going to be angled. It messes with my mind. I had to do this several times before I got this right. Once you are sure of your stamping, stamp your image in your window. I used my Tim Holtz Stamping Platform to make sure I got this right and that I could re-stamp this if I needed. You need nice solid lines to get the animation to work properly. 5. Build your Animation Place your grid in the envelope in front of your stamped image. Put glue on the flaps of the envelope and glue them down. Slide in your animation grid. You can play with it now and watch as the dragonfly takes flight. 6. Make the Card Fold a piece of 8.5" by 11" card stock in half hamburger style. This is the outside of the card. Take a second sheet of the same size and color card stock and cut it in half hamburger style. You will use one of the half pieces later. 7. Cut your Stand We're going to work on the inside of the card. 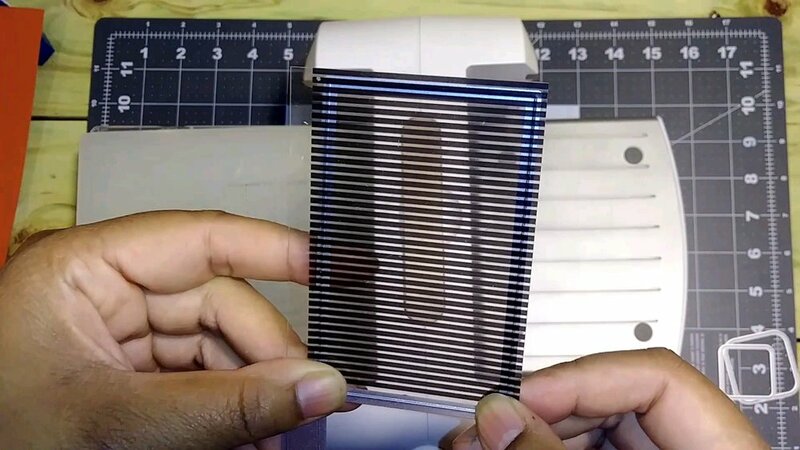 Fold a 6.5" by 9" piece of paper in half hamburger style. Find the center of the crease. Make a 1" cut one half inch away from right of center. Make a second 1" cut one half inch left of center. When you open the card you should have a tab that is 1 inch wide and 2 inches long. Close the card but push the tab to the inside so that it folds the opposite way of the card. 8. Glue the Animation Glue the animation to the front part of the stand. This is the part that is facing you when you open it. Make sure the tab is facing up. 9. Adjust the Grid With the card open pull the grid to the top of the envelope. Glue the ribbon to the outside of the card. Cut off any extra ribbon. When you close the envelope, push the grid to the bottom of the envelope. Push it back down to the bottom when you close the card. 10. Decorate Outer Card Glue one of the half sheets to the outside of the card and cover the ribbon. You can decorate the card how ever you like. I chose to keep mine simple since all the interest was inside the card. I used a sticker from the Paper House 'Field Study' paper pad. It's full of cute images and realistic forest photos. I also used one of the papers to make the animation envelope. So how did it turn out? Check out my YouTube video if you need to see what I did. Show me what you made on Instagram using #cornerstonecreate. If you are interested in any of the materials I used in this tutorial head over to my Stash. All my craft room staples are there with multiple links. Or check out these links at the bottom of the page.